San Vincenti farm is located on an area of 148 acres in Gaiole in Chianti at an elevation of 1400 to 4500 feet above sea level. The owner of this charming privately owned winery in Gaiole in chianti is called Roberto Pucci, a 70+ year old dynamic entrepreneur from Prato, who became enamoured of the beautiful Chianti area a few years ago and decided to dedicate all his resources to the production of wine with great character. Leading this project is a sacred figure of Italian oenology, Carlo ferrini, a total connoisseur of Chianti Classico and creator of cult wines known and appreciated by lovers of wine from all over the world. 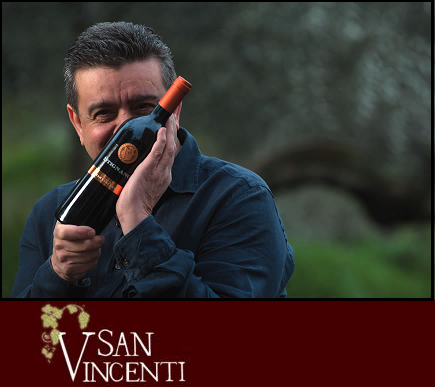 San Vincenti winery owns two vineyards: STIGNANO which extends for 14 acres. Half of the acres are planted mainly with older Sangiovese grapes and the other half is entirely planted with newer Sangiovese. LE CORTICELLE has 5 acres planted wth Merlot grapes. The soil of this area is a mixture of clay and calcareous rock called galestro.